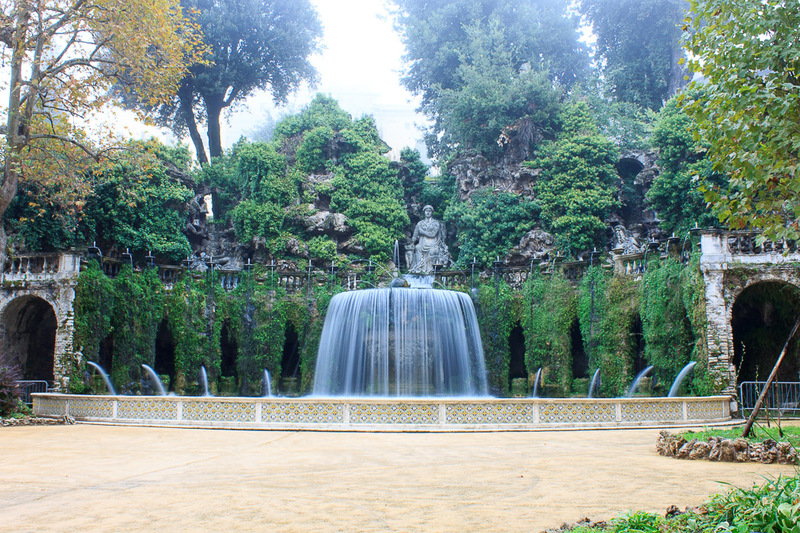 If you love fountains, go here. 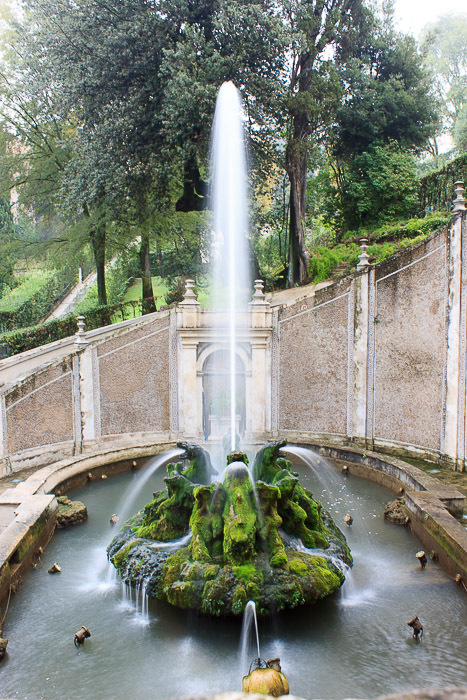 Villa d'Este is an early 17th century villa of the d'Este family which has a spectacular terraced garden area filled with many water fountains. To get there from Rome using public transportation, take Metro Line B (blue) to Ponte Mammolo, then walk downstairs into the bus station to buy a ticket (and your return ticket) on the local blue Corval bus to Tivoli. It should cost €2.20 each way, and 3 buses run per hour for the 45 minute bus ride. Get off the bus in downtown Tivoli, which is after the bus reaches the top of a winding hill. 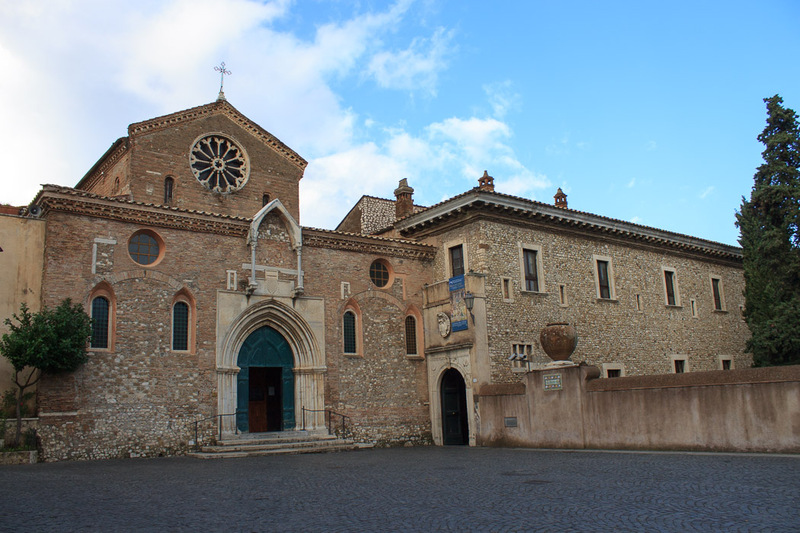 Walk across the central square past the modern arch (photo at bottom of this page) to get to Villa d'Este. 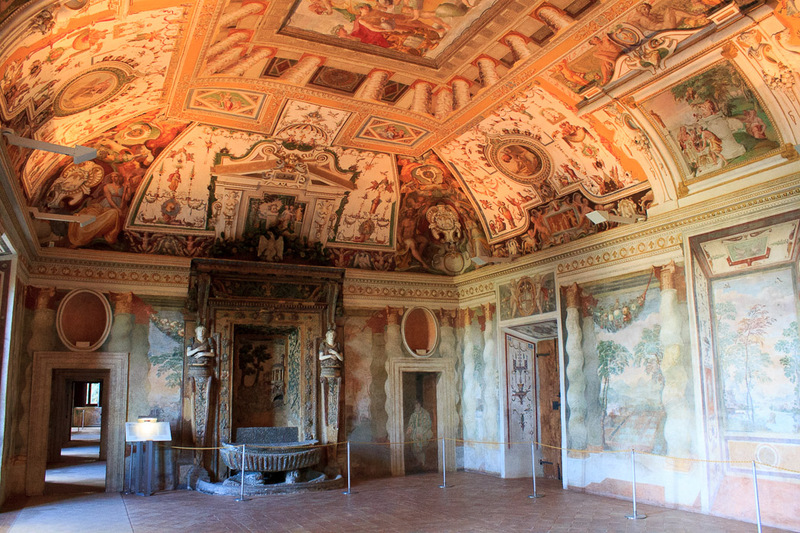 The villa itself is only mildly interesting, actually closer to barely interesting; the real action is in the garden out back. 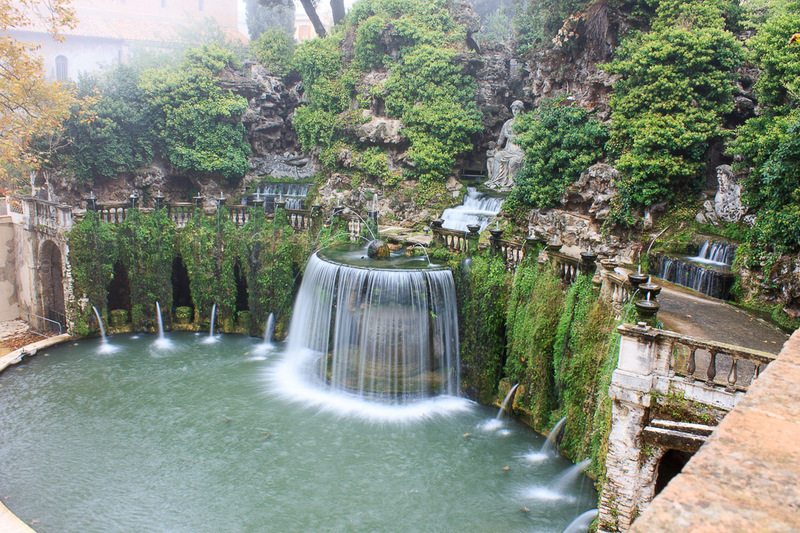 See all Villa d'Este photos. I arrived early in the morning on a day that had some fog. The view beyond the gardens to the town and hills below (1st photo below) was rather pretty, I thought. 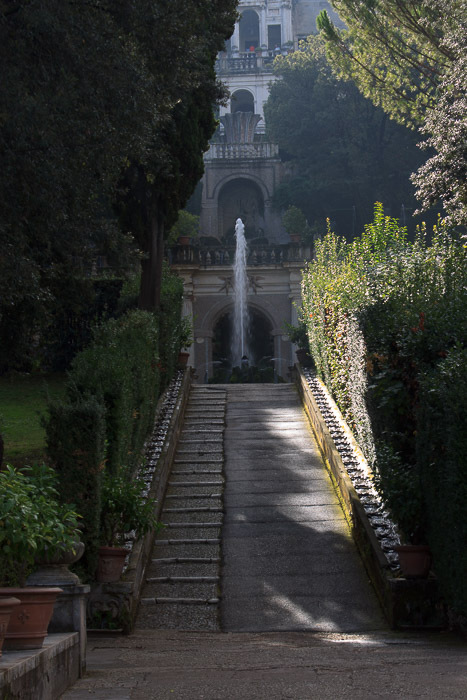 When you step out of the villa into the gardens you're at the top level of the gardens; ramps and stairways take you from this highest level to the lower levels of the gardens. But before you begin, you can enjoy the view of the countryside beyond the gardens from this top level. 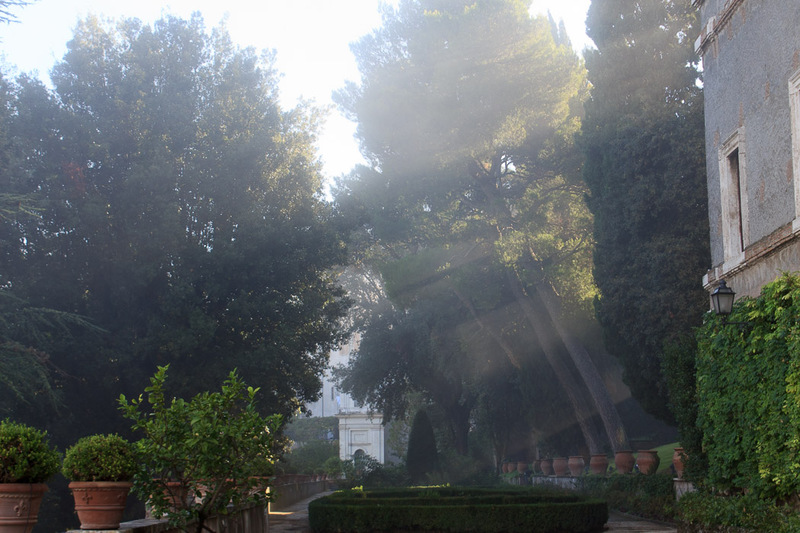 The sunbeams trying to work their way through the fog at this upper level were picturesque (2nd photo below). 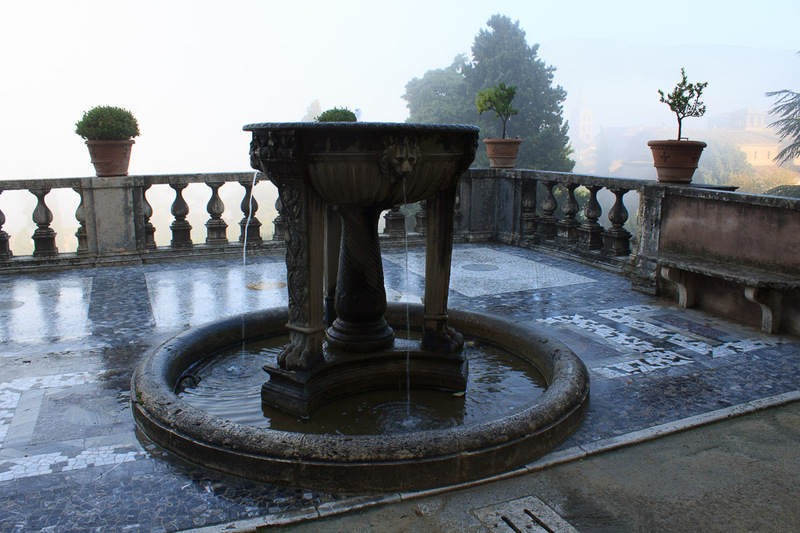 The first fountain you come to on the prescribed route through the gardens, right near this topmost perch, is the extremely modest Fountain of Leda and Tripod (1st photo below). Shortly thereafter is the Fountain of Europa and Pegasus (2nd photo below). 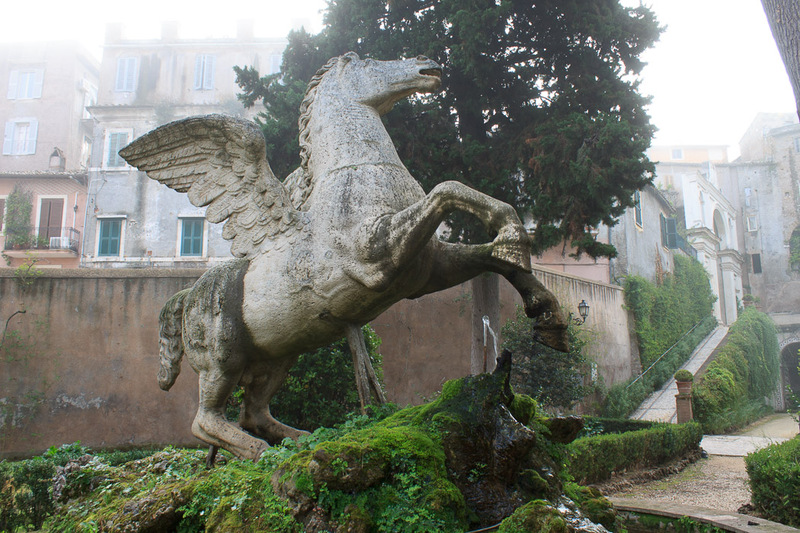 The fountain is dominated by a statue of Pegasus, the famous mythical winged horse which sprang from Medusa's blood when Perseus beheaded her. The newborn horse flew to Mount Olympus where he was tamed by Athena or Poseidon. Pegasus bore Perseus to the rescue of Andromeda. In the fountain, the horse has outspread wings as if he is about to fly off. Looking out over the railing you can look down into the Fountain of Tivoli, also called the Oval Fountain (1st photo below). 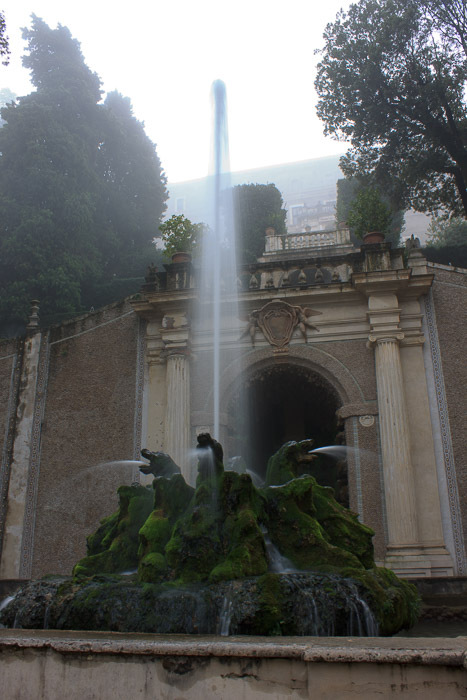 The Tiburtin mountains are represented by the greenery above the fountain, and three rivers cascade off those mountains (the Aniene, Erculaneo and Albuneo). Water cascades from the raised oval basin into a pool below. 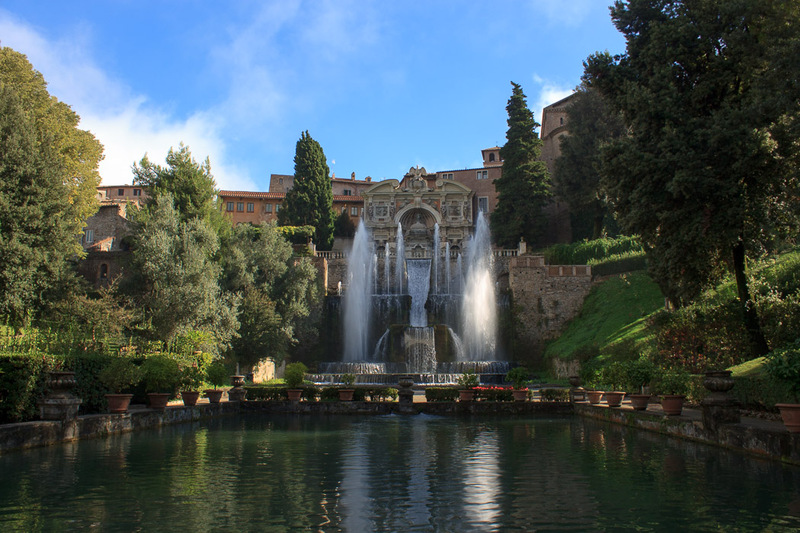 The fountain has statues representing mythological heroes glorifying the d'Este dynasty and the greatness of Tivoli. Once you walk down to the fountain's ground level, the view transforms into that shown in the 2nd photo below. 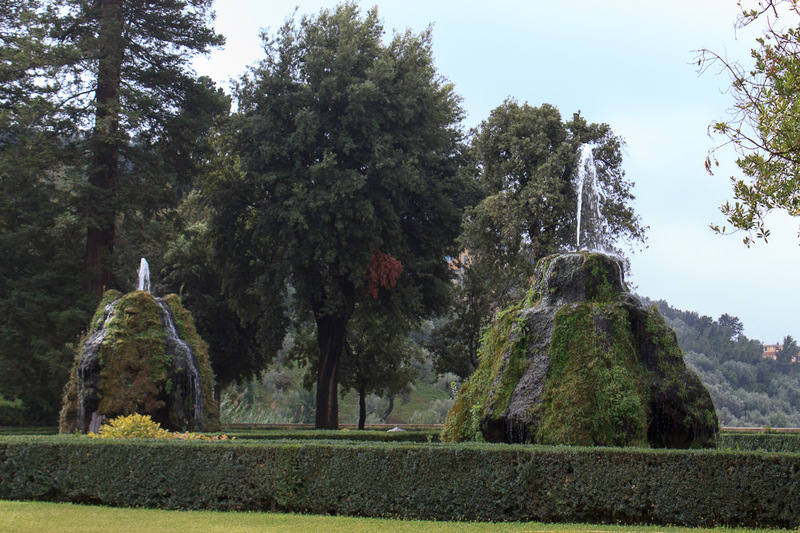 At the same level as the Fountain of Tivoli, stretching all the way across the gardens is a line of fountains called the Hundred Fountains, shown in the two photos below. Gurgling water spouts from a hundred or so carved fountainheads in various shapes and forms, including lilies, eagles, obelisks and sailing boats. 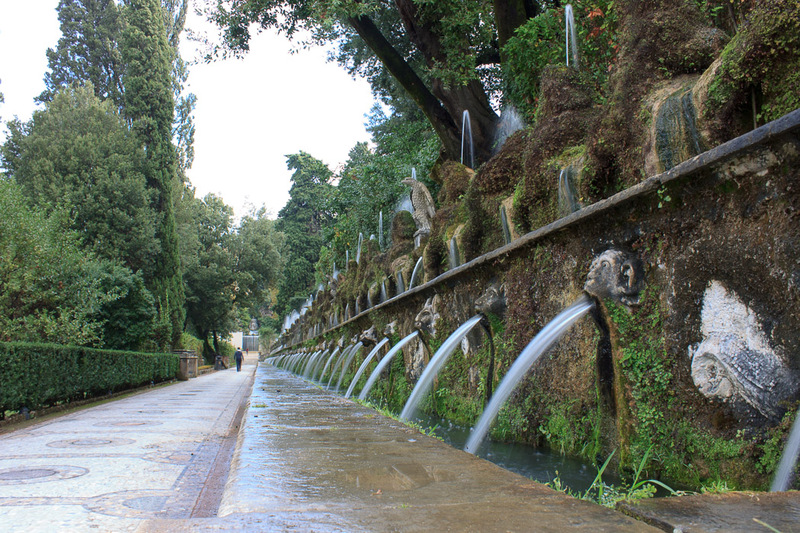 The water falls into long troughs, forming streams which flow along the three levels and represent the three rivers (Aniene, Erculaneo and Albuneo). At this point in my walk through the gardens, the fog has not yet burned off, in fact, it's gotten thicker, and makes the morning air quite chilly. I'm definitely feeling it was a mistake to wear shorts here, as the fog blocks the sunlight and cools the air with its mist. One level down takes me to the Fountain of the Dragons (two photos below), so named because although the most prominent feature of this fountain is the tall upward-shooting jet, four moss-covered dragons at the base add their contribution to the action. At one end of the next lower level of the gardens is the Fountain of the Organs (1st photo below), which plays actual music thanks to a complex mechanism invented by the Frenchman Claude Venard. 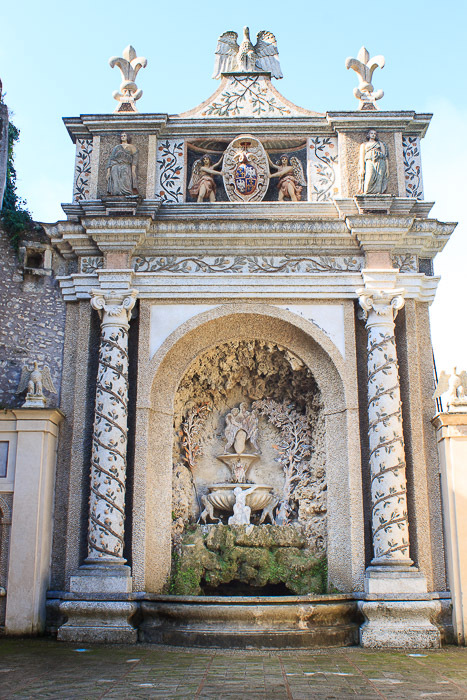 The Water Organ Fountain, as it is also known, is of baroque design, so deviates from the Renaissance style of the rest of the villa and its gardens. Every hour or so, the organ plays (rather quietly, don't be too near another fountain whose splashing water overwhelms the organ's faint tones). 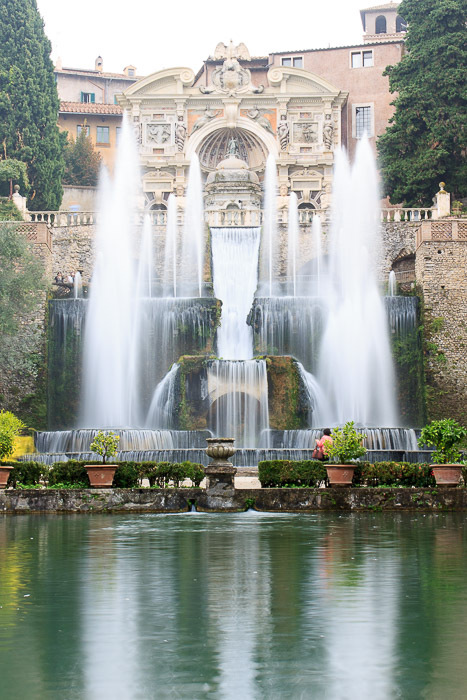 In front of the Organ Fountain is the most spectacular water feature at Villa d'Este: the Fountain of Neptune (2nd photo below). 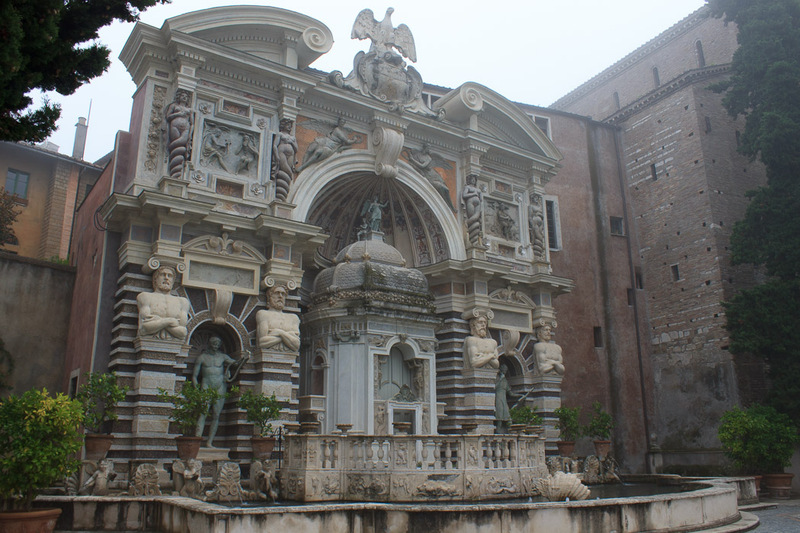 Bernini originally built this fountain, but it was irreparably damaged by two centures of neglect. 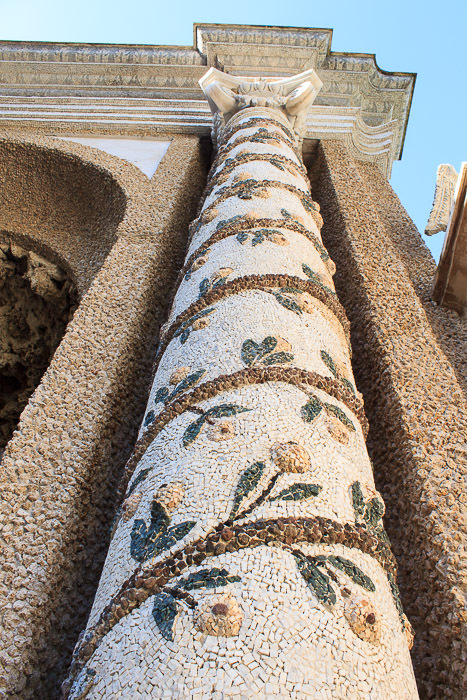 Around 1930, Attillo Rossi carried out substantial restoration work. 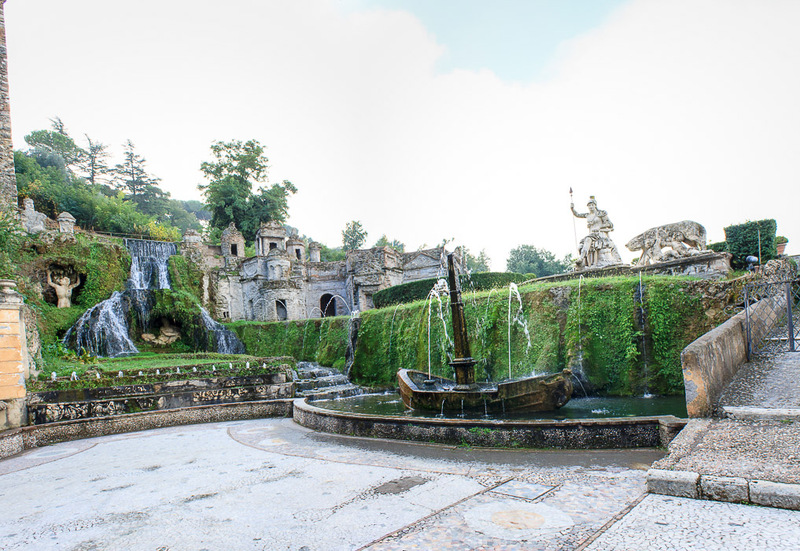 With the help of engineer Ermo Salvati, Rossi restructured the gradient in front of the Organ Fountain and created the spectacular Neptune Fountain that can be seen today. The main jets of the Neptune Fountain shoot 45 feet into the air; can you see the person in red standing at the base of the fountain? There is a bust of Neptune between the two tallest jets, but I didn't see it. 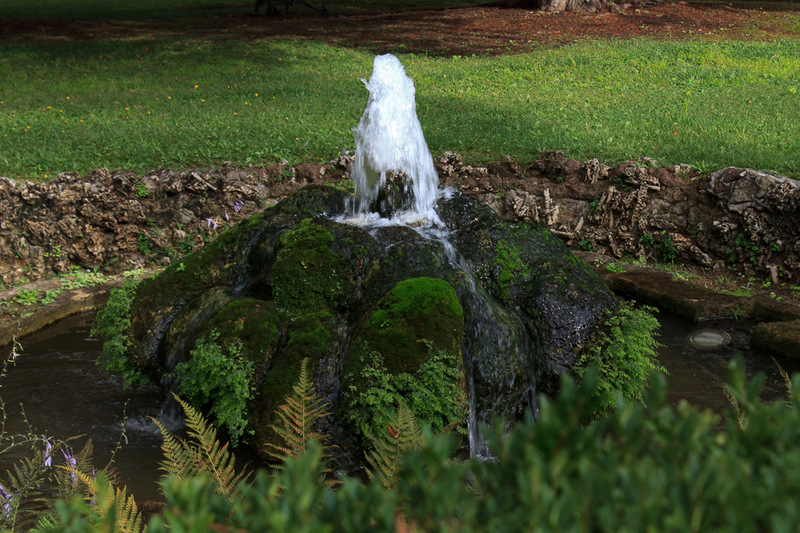 This is the only fountain on the premises created during the 20th century, and the only one that's driven by pumps rather than simple water pressure from the pull of gravity as the water makes it's way to the fountains from its source. 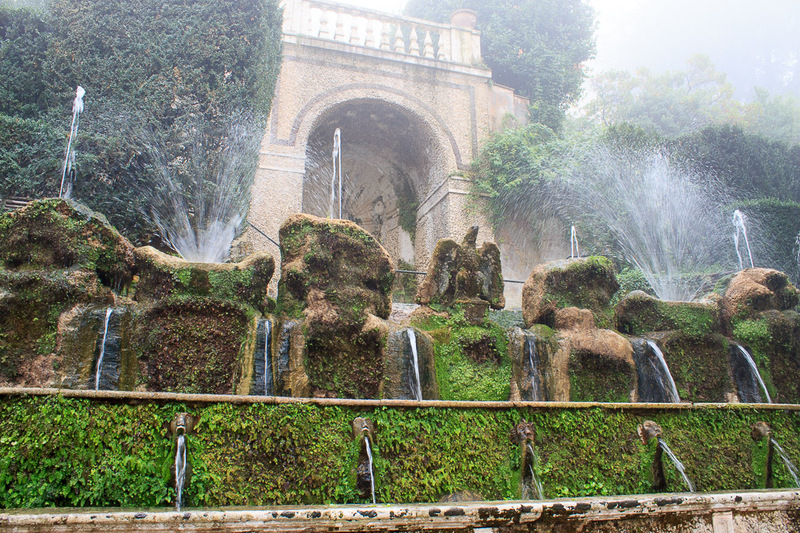 One level down again is the lowest level of the gardens at Villa d'Este. A round feature surrounded by seats is found in a grove of ancient cypress trees which might be among the oldest in Italy. In the center of the circle is the fountain shown in the 1st photo below. Nearby is the one shown in the 2nd photo below. 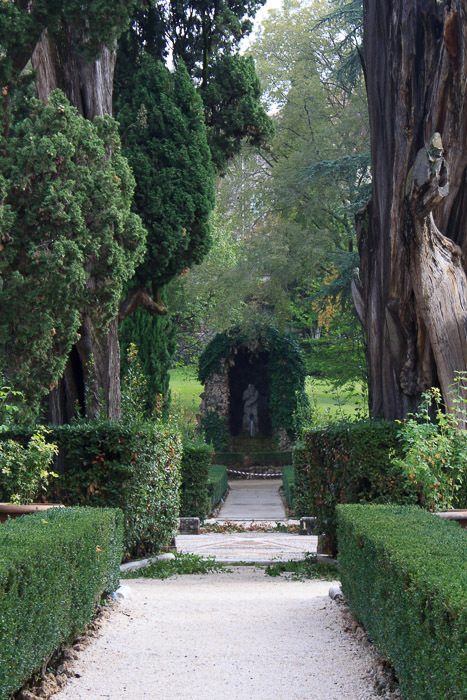 Some of the cypress trees, and some of the gardens that these fountains are found within, are shown in the 3rd photo below. 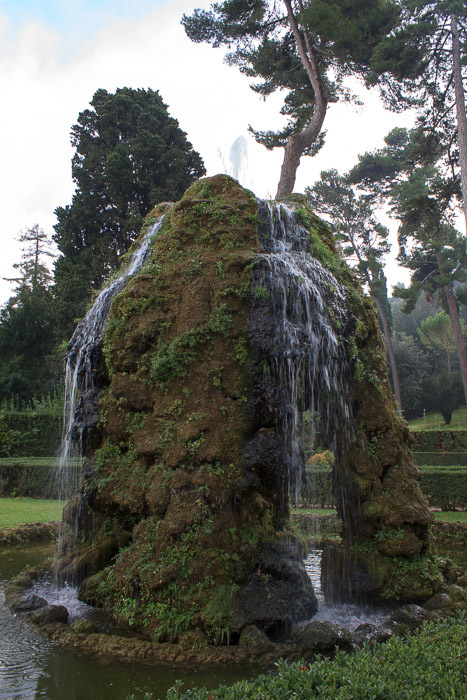 The Fountains of Mete Sudanti are pretty cool-looking moss-covered rocks. They represent the Meta Sundans (sweating cone) fountain in Rome, once located not far from the Arch of Constantine, where gladiators washed after fighting in the Colloseum. It was built between 89 and 96 AD, just a few years after the completion of the Colloseum, as a large monumental conical fountain which sweated water rather than jetting it out the top. The fountain was damaged during the Middle Ages and finally destroyed in 1936 when Benito Mussolini had its remains demolished and paved over to make room for the new traffic circle around the Colloseum. The 1st photo below shows a hint at the first of two large ponds (stocked with fish) in front of the Fountain of Neptune. The 2nd photo below is a view of the Dragon Fountain and the Villa above it, taken from a pathway in-between the two ponds. The Fountain of the Owl (1st photo below) has a hydraulic device which uses the power of the cascading water to propel an artificial owl towards some little bronze birds perched on bronze branches, "frightening" them and causing them to stop twittering. The twittering was produced by the pressure of air coming out of the birds' beaks. Althouth the fountain was recently restored to working order, It wasn't operating during my visit. But the ceramic columns surrounding the fountain (photo at near right) are impressive. The nearby Porsepina Fountain (photo at far right) shows Porsepina being carried to the underworld after being abducted by Pluto. Except I think the fountain might be too overgrown and ruinous to make out that scene. 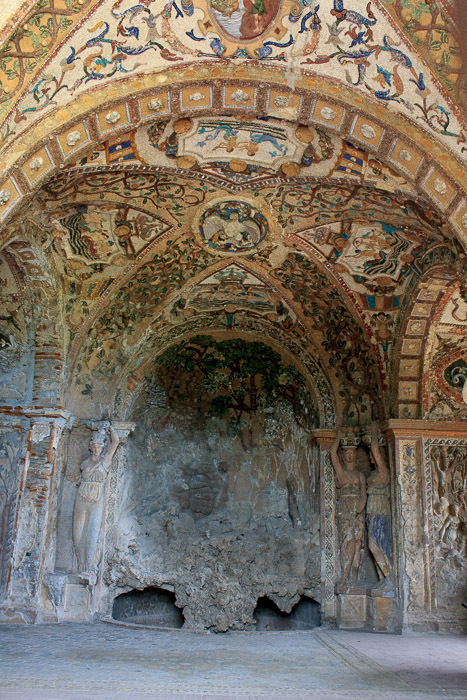 The Fountain of Rometta (1st photo below) represents ancient Rome and contains many of its symbols. 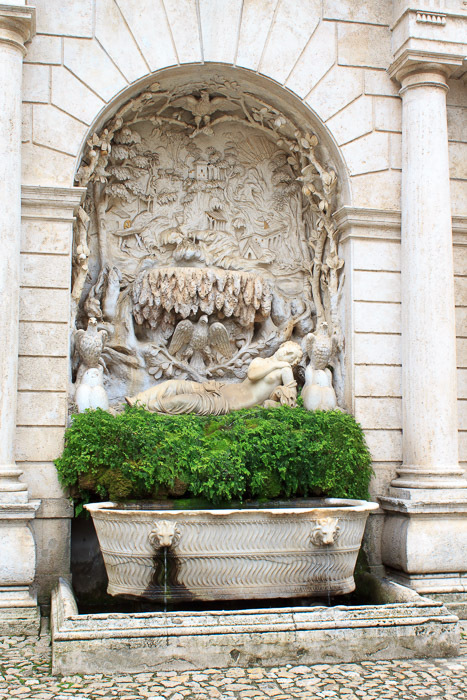 The She-Wolf and the helmetted personification of Rome at the upper-right corner of the fountain are shown in the close-up 2nd photo below. The boat below them represents Tiber Island. Inside the lower cave on the left is Marforio, the symbol of the Tiber River. I don't know who the woman holding up the cave to his upper-left is. 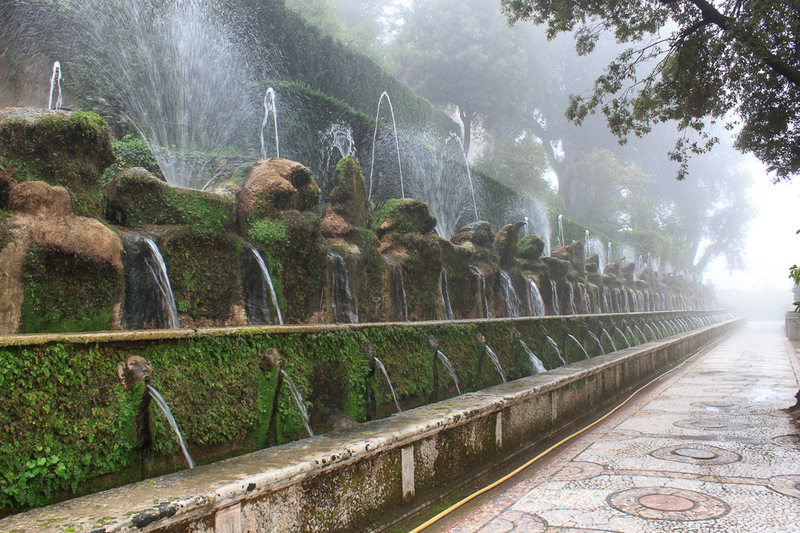 At the Fountain of the Rometta, we find ourselves at the other end of the Hundred Fountains from where we started. You can see from the 1st photo below that the fog is completely gone by now. 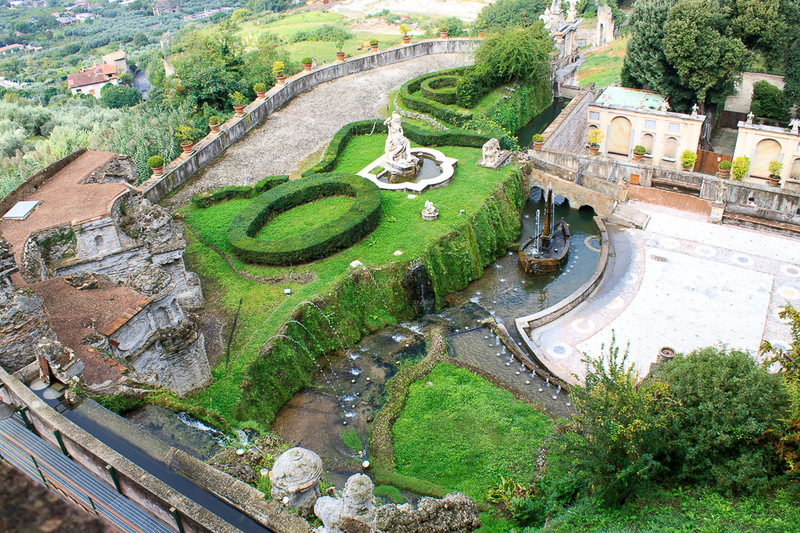 Continuing the hike up stairs and ramps to ascend out of the gardens and back to the villa, there are views of the fountains now familiar, including the view of the Fountain of the Rometta from above, shown in the 2nd photo below. 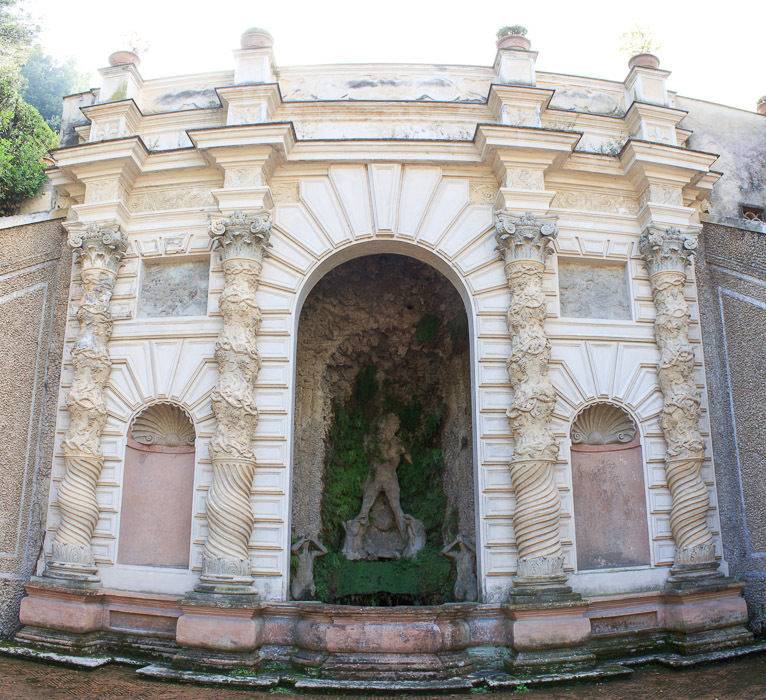 A final fountain on the grounds of Villa d'Este is shown in the 1st photo below, the Grotto of Diana. 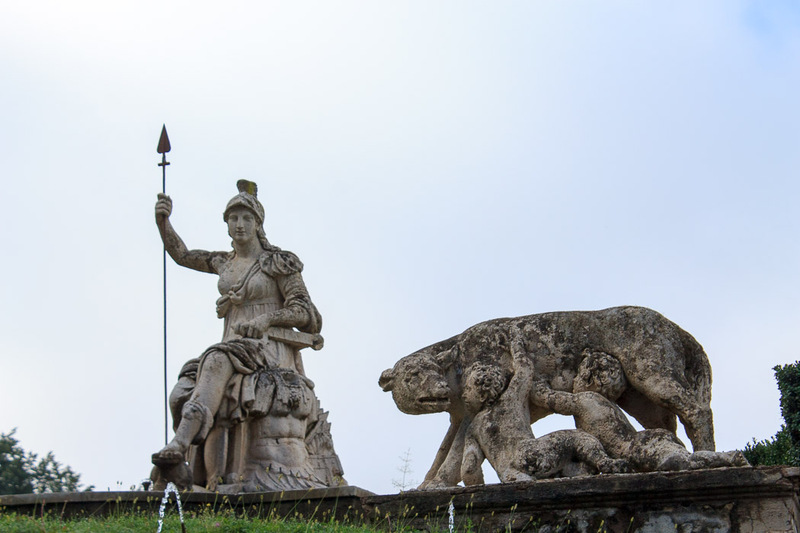 The statues that adorned the cave, depicting two Amazons, Minerva and Diana the huntress, are now in the Capitoline Museum. 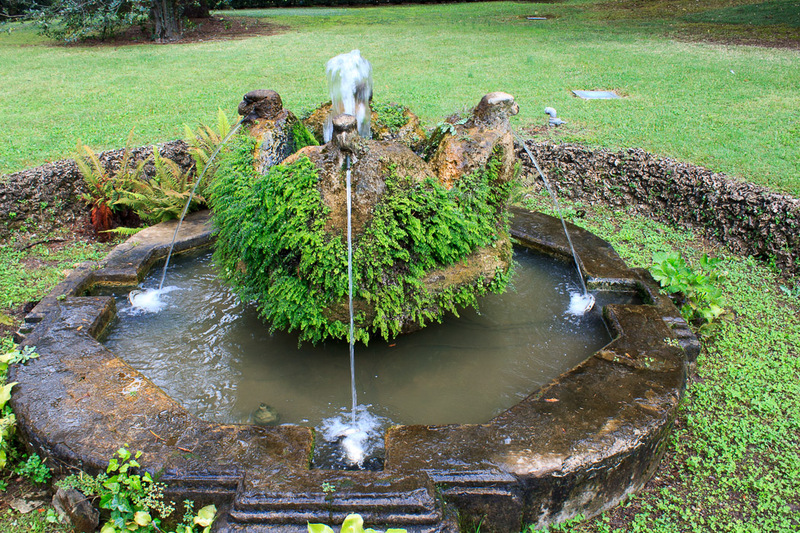 Once outside the grounds, a bathtub fountain shown in the 2nd photo below can be seen. 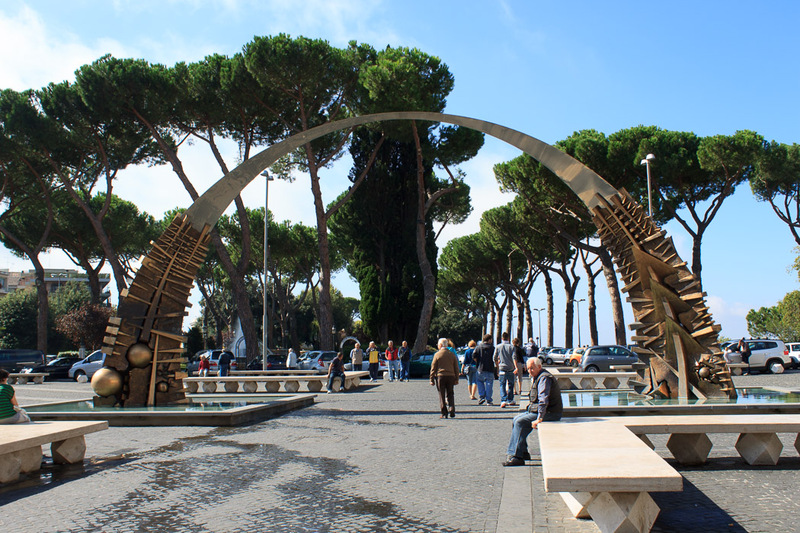 To go back to Rome, walk back through the arch (1st photo below) to the main square in downtown Tivoli, and continue walking to the Corval bus stop back on the main road next to the playground in the park. 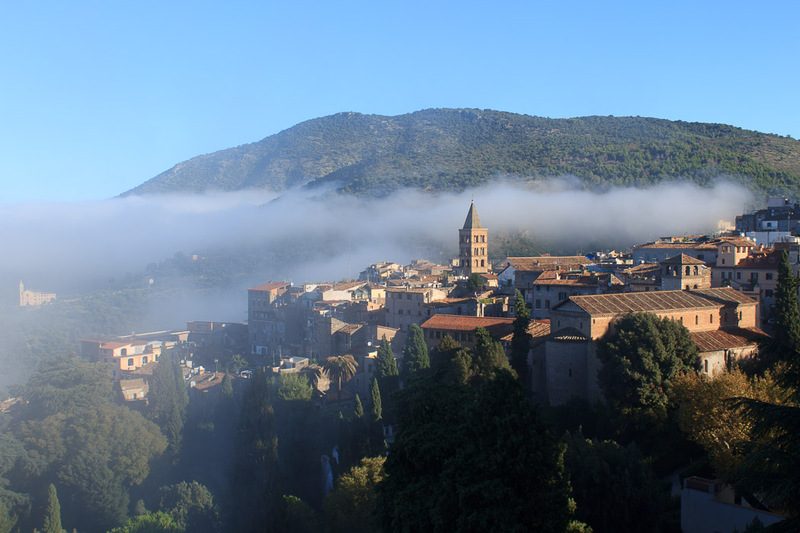 The bus will take you to Ponte Mammolo, where you can ride the metro back to your hotel. If you forgot to purchase your ticket, you can stop at the tobacco shop across the street from the bus stop. If instead you're going to Hadrian's Villa, I suggest you either take a cab (they should be near the arch) for about €10, or buy a €1 ticket at the tobacco shop for the yellow bus to Villa Adriana (Hadrian's Villa), which you pick up at that same bus stop near the playground.